Jūrų širšė (Chironex fleckeri). zoltantakacs.com nuotr. When we love a woman or a man, our eyes hook on the edge of her smiling lips, glide on the smear of light on his cheeks, drift in the haze smoldering in her hair, two-step in the sparkle of his eyes. All these surface effects. Our eyes trail his fingers stroking the leather sofa, sway in the web of her gestures. These surface patterns that take form and disappear. When we embrace a woman or a man, we stroke the truss of the shoulders, feel gusts of breath on our throat, tingle the ghost fur of the arms, trawl the pleasure shivering across her or his skin. We recoil from thinking of the contents of the body we are holding up against our own—the stomach pouch, the intestines, spleen, liver, kidneys, the biles. Contained and also protected by our skin, the inner contents of our bodies are concealed from others and also from us. They keep what they are doing secret. We do feel, vaguely, something of what is going on back there, in a mix of attachment and aversion. We are attached to the beating of our heart and to the crisp air swelling our lungs. We feel distaste in the brief thought of our kidneys, our liver, the biles, the slabs of yellow fat, the grisly kinks of our intestines pushing along chunks of mush turning brown with dead bacteria. We feel repugnance over substances expelled from our bodies—gases, excrement, vomit, mucus, pus. What we call filth, what provokes disgust outside, are things we come upon that resemble what comes out of our bodies or what is inside them. Box jellyfish, Chironex fleckeri, common in the South Pacific, produce and store in their bodies the most deadly venom in the animal kingdom. Contact with only 3 cm of a tentacle can be fatal for an adult human, and people have died three minutes after being stung — faster than from the sting of any snake, insect, or spider. Box jellyfish consist of a four-sided body called a bell from which hang four clusters of 15 tentacles, each of which has about 5,000* stinging cells. This venomous overkill is used to kill fish and shrimp instantly, so that their struggle would not damage the jellyfish’s delicate ten-foot long tentacles. Box jellyfish have four clusters of 6 eyes each, four of which, the pit eyes and slit eyes, detect light and shadows, but the other two have lens and cornea, an iris that can contract in bright light, and a retina. One of these is turned upward and can see objects out of the water. 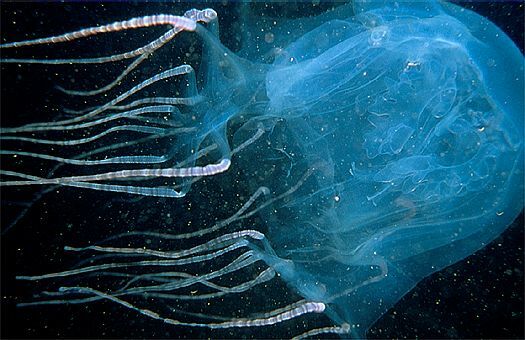 Box jellyfish are able to see tiny objects and their own transparent bodies. By pumping water in and out of their bells, they can move up to 2 yards a second. Box jellyfish are transparent and pale blue in color, which makes them pretty much invisible in the water. So much so that for years nobody knew what was causing swimmers such excruciating pain, shock, and heart failure. Since 1954 box jellyfish have been determined to have been the cause of 5568 human deaths. A group of jellyfish is called a "smack." Spots and zigzags of gaudy colors cover the skins of the coral fish; gold plumes stream over the backs of birds of paradise; lacey crests tipped with white circles spread over the heads of Victoria Crowned pigeons; stripes, different on each one, cover the bodies of zebras, manes fluff about the heads of golden tamarins. These surface colors and patterns have no relationship with the functional parts of their bodies; they do not outline lungs, stomach, or muscle systems. They are organs to be seen, Adolf Portman explained, snares for the eyes. Or they are screens set up against eyes, such as the camouflage colors of ground-nesting female pheasants. The mottled browns of his plumage of the Malay Great Argus pheasant hides him in the forest, but in courtship he opens the three-foot-long decorative feathers of his wings into a complete circle in front of him, and performs complex dance steps before a female. Watching him perform, we murmur: he knows how he looks to her; he knows he is gorgeous. We sense that we are frowning, expressing skepticism, looking surprised or sarcastic, or rather we know that we are. We know that our expression looks quizzical, shocked, or ironic. But we have no view or feeling of the muscle contractions and dilations, nervous circuitry, and pulses of blood behind our skin that engineer those surface expressions. Our expressiveness, our convictions, attitudes, character, our personality are on our skins. At the “Body Worlds” exhibition, cadavers are on display that were preserved not by replacing the blood with formaldehyde but by replacing the blood, body fluids, water, and fat with liquid plastic, a technique invented by Gunther von Hagens. There we see that those whose faces are skinned are now anonymous. We cannot imagine what these individuals were like. Remove the skin and you remove the expression, the attitude, the personality. We move, we act by not seeing how we move. We can dance only when we stop watching where we are putting the right foot, then the left foot; we type not looking at where we are putting our fingers. When we move, we look outside. We scan the environment for open spacs and for pathways toward objectives in the distance, catching sight of moving obstacles. We can see the environment about us because we do not perceive anything behind our skin. By looking at the surfaces of the body of another human, we envision what he is looking at, where she is going, what he is going to pick up and manipulate. We accompany his or her life. In embracing a woman or a man we sense the commonality of life in us. The life in us likewise understands the life in other species. We look for what the vultures are circling over, we follow the inquisitive dog, we feel the misery of the caged puma. There is an inner desolation in a human life that speaks to only human voices and grasps only human hands, caresses only human bodies. Evolved in Earth’s ecosystems, our life is destined to know life, to answer the voices of lambs and Bactrian camels, meet the gaze of owls and octopods, fondle the faces of cats and zebras, skip and soar with robins and albatross, hum and chant with bumblebees and locusts, creep and shimmer with caterpillars and silverfish. In the ocean we weave scull our fins and swim with the fish. The one word we use — life — to characterize all of them indicates that our bodies deeply feel kinship with the bodies of other animate species. But when we come upon jellyfish we find ourselves at the limit of what the life in us can understand. We cannot imagine what it would be like to try to climb a ladder, to pick up things, to sit down if our bodies, like those of box jellyfish, were transparent. If we could not help seeing our glands secreting biles, our intestines processing our last meal, our nervous circuitry throbbing and producing dilations and contractions in bundles of muscle fibers, we could not imagine how we could move and act among the things spread out about us.